The development of highly efficient and inexpensive catalysts for oxygen evolving reactions (OERs) is extremely urgent for promoting the overall efficiency of water splitting. Herein we report the fabrication of a series of amorphous NiFeB nanoparticles with varying atomic ratios of Fe to (Ni + Fe) (χFe) by a facile chemical-reduction method. The amorphous NiFeB (χFe = 0.20) nanoparticles, combining the merits of in situ formation of borate-enriched NiFeOOH catalytic surface layers, intrinsic amorphous nanostructures, and an optimized degree of Fe doping, displayed highly active electrocatalytic performance towards the OER in a broad range of pH values (from alkaline to neutral conditions). The catalyst exhibited a relatively low overpotential of 216 mV with a Tafel slope of 40 mV/dec on Ni foam and 251 mV with a Tafel slope of 43 mV/dec on glassy carbon at 10 mA/cm2 in a 1 M KOH solution, demonstrating much greater OER efficiency than that of commercial RuO2. Long-term stability testing of the OER performance of NiFeB (χFe = 0.20) by chronoamperometry (overpotential (η) = 320 mV) over 200 h revealed no evidence of degradation. Facile, scalable synthesis and highly active water oxidation make the NiFeB nanoparticles very attractive for OER electrocatalysis. 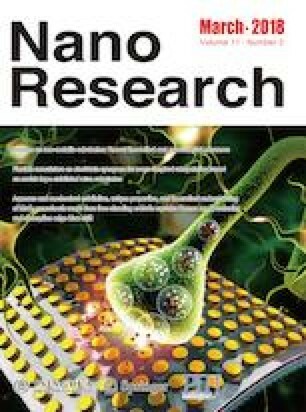 Supplementary material (further details of SEM, EDS, XRD, N2 adsorption—desorption isotherms, XPS spectrum, electrochemical characterizations for different NiFeB nanoparticles and supplementary tables) is available in the online version of this article at https://doi.org/10.1007/s12274-017-1783-0. We appreciate the financial funding supported by the National Natural Science Foundation of China (No. 51402205), Natural Science Foundation of Shanxi (No. 2015021058) and Scientific and Technological Innovation Programs of Higher Education Institutions in Shanxi (No. STIP-2016131).